Uncraftable Military grade semi auto rifle. 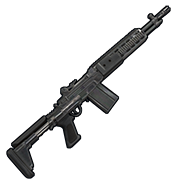 Offers a slightly higher magazine capacity and higher damage than the craftable semi auto rifle. A military upgrade to the Semi-Automatic Rifle long range and highly accurate. Can be used to kill fully metal geared people. Rarely found in Supply Drop and Hackable Crate. You should use a 4x scope most of the time. but when in cqb switch over to your holo.